NEW! The highest performance and most features are packed into this great new system. Touch screen control with programmable stitch regulation and adjustable brightness LED work light. Customizable user settings for your personal needs. Artists and pros alike will appreciate the sleek clean design or our new NV. The NEW NV is the fifth generation of stitch regulation for Nolting longarms. The NV stitch regulator features the touch screen controls of four stitching modes plus single stitch and needle up/down. The accuracy and responsiveness of the totally updated electronics establishes this package as the industry's best. 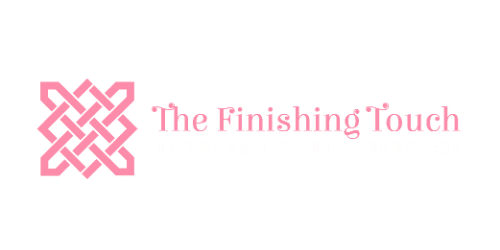 The professional tool used all day and every day to finish quilts around the world. 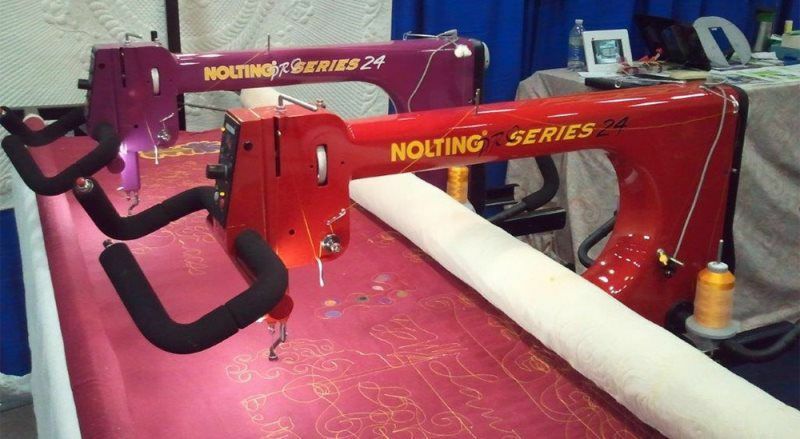 The Nolting Pro Series is our famous long time workhorse. Intellistitch Turbo stitch regulation, needle up/down, single stitch, standard speed control and many more features give you all the settings you need. Customizable handles front and rear can be set for your unique wrists, elbows and shoulders. 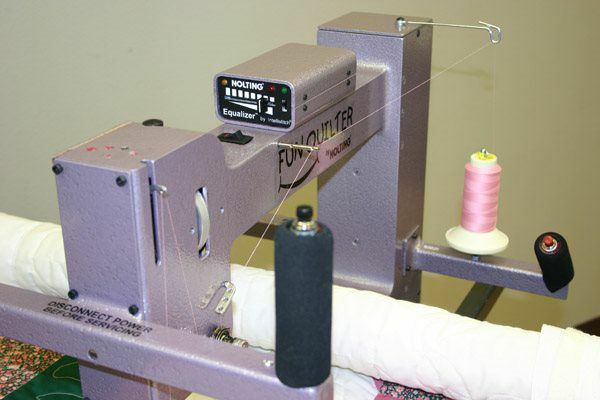 Our commercial longarm with Intellistitch Equalizer stitch regulation, needle up/down, standard speed control and fixed position handles both front and rear. Great for business or for personal use. Popular as a rental machine because it is so easy to understand and use. Also a great choice for pairing with a computer operating system. Basic commercial longarm with no frills. Standard speed control and fixed position handles both front and rear. Continuous speed controller with regular size hook assembly. 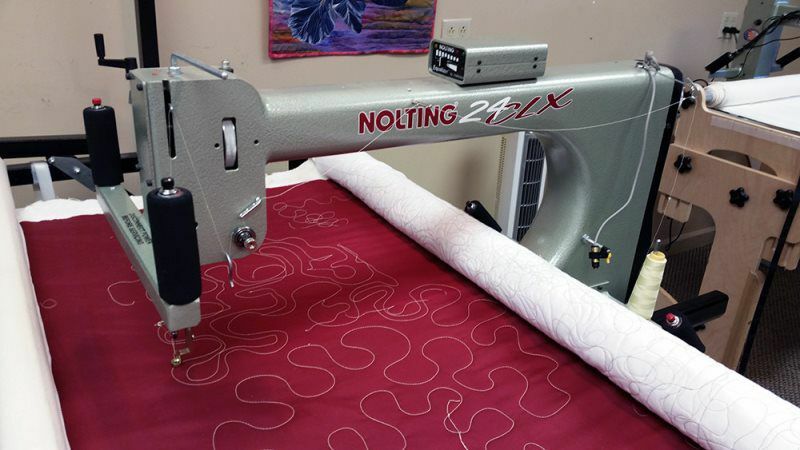 Our most economical commercial longarm. Nolting quality with all the same metal gears, shafts, pulleys and sewing components as our commercial machines in a more economical body. Intellistitch Equalizer stitch regulation, needle up/down, standard speed control and fixed position handles front and rear. 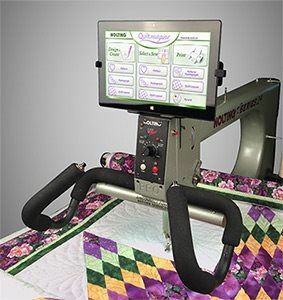 Start with a full Fun Quilter system or upgrade to a Fun Quilter and put it on the frame you already own. Continuous speed controller with regular size hook assembly. 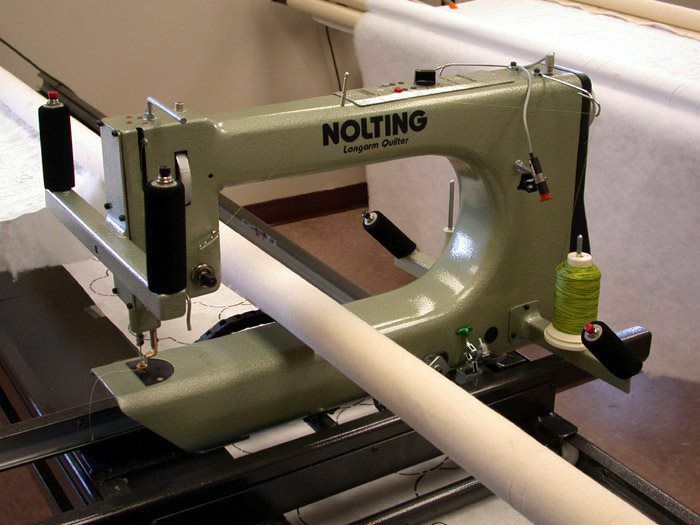 Computer operating system designed specifically for any stitch regulated Nolting longarm on the current style Nolting commercial frame. You can add it to a new or existing system. Uses your own Windows based tablet. We provide the software and robotics. Quiltmagine comes preloaded with over 250 patterns. Compact version of our great machines designed specially to be both economical and versatile. This all metal lightweight will work on any machine quilting frame. 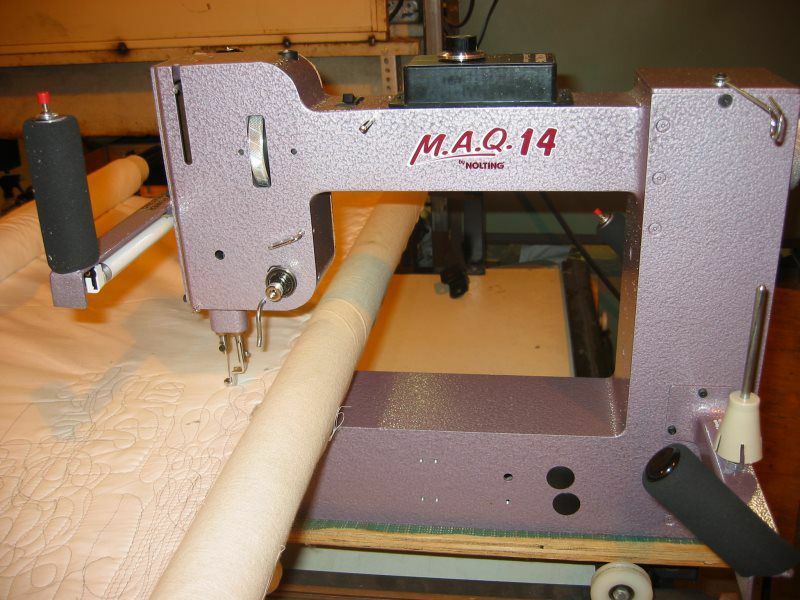 Standard speed control, fixed handles front and rear, hopping foot, high head for good needle visibility, easy access to the bobbin and low price makes the MAQ14 a very popular replacement machine or first step. 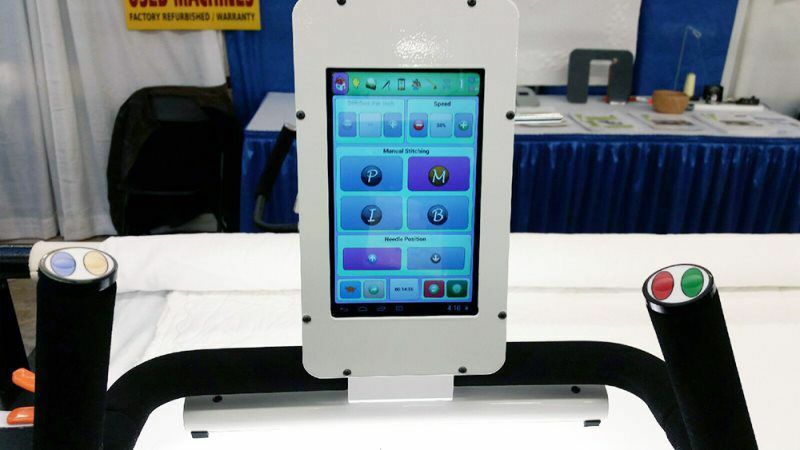 We now make a 14" x 8" hobby machine. It sits on almost any frame intended for home sewing machines, shortarms or longarms. Keep your frame just add this machine. 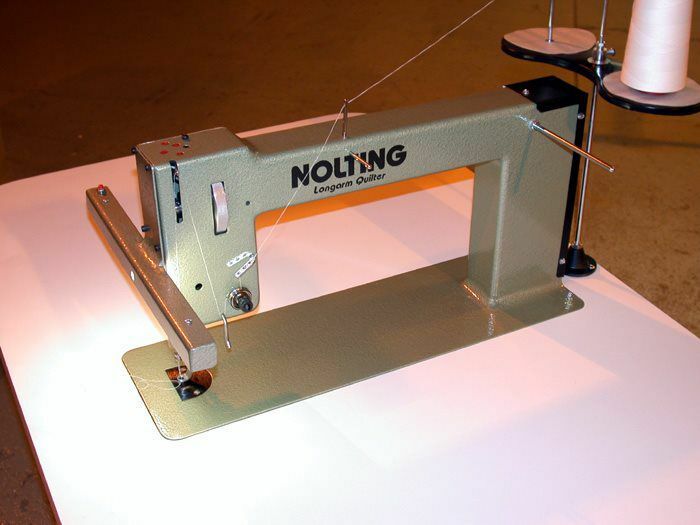 You can replace your small plastic home sewing machine with this 14" x 8" all metal compact longarm. Standard speed control. Same handles and sewing mechanism as the larger machines both front and rear. Hand wheels both front and rear. Lavender in color. Regular size hook assembly (L). Ask us about providing you with a frame. Stationary longarm set into a table top. You move the fabric not the machine. Foot pedal control. Basic, low cost simple and compact for smaller spaces. 16â€ reach x 8â€ of inside height. Hand wheel and hopping foot. High head and great light over the needle. The Quilting Bee sits in the table perpendicular to your shoulders like a longarm.